We offer a duality-based methodology for incorporating multi-sector effects of international trade into open economy macroeconomic models, developing the concepts of the dynamic factor price equalization set and the integrated intertemporal equilibrium. Under this approach, the aggregate production function depends on output prices and factor endowment stocks. It preserves all of the structure of a standard GDP function from the trade theory literature. 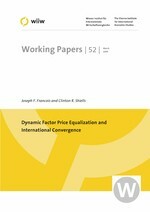 In a two-country version of the model considered below, we examine the properties of the dynamic factor price equalization set. If the global economy is initially outside of this set, the equations of motion will pull the economy back into this set. Inside the dynamic FPE set, factor prices are equalized internationally, and with identical tastes and technology, the economy can be regarded as a fully integrated world equilibrium in a dynamic sense (the integrated intertemporal equilibrium). In this equilibrium, all of the standard properties of a closed economy one-sector neoclassical growth model hold, ruling out cycles and chaos, and allowing us to characterize the evolution of international inequality and the persistence of productivity and endowment shocks. Working from the integrated intertemporal equilibrium, we identify properties of persistence linked to inequality and real economic shocks. Cross-country differences in per capita incomes and wealth, and the factor content of trading patterns, may persist over time and even into the new steady state. This provides yet another reason why we might observe lack of income convergence internationally. In addition, real shocks in one country may be transmitted to the other country through factor markets and product prices, and may have persistent effects into the steady-state as well. The model can also generate an endogenous Balassa-Samuelson effect.